Roswell Pedicabs was founded in 2013 by the Weissman Family to serve the Roswell Historic District and Special Events facilities with a fun, engaging and unique experience. The company was purchased by Doug Fallon in 2017 and continues operating with the same vision. 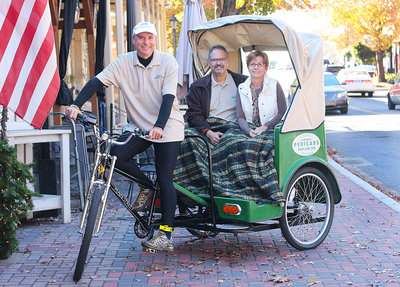 Since 2017, Roswell Pedicabs has expanded its offerings to include pedicab rentals for for TV and movie productions, Historic Roswell Pedicab tours, Date nights, and Wedding entrances and take away services. We are Roswell, GA based, but can serve customers in the greater Atlanta area. In keeping with the fun, engaging unique experience vision – Contact us if you have a special request, We will be happy to be a part of your plans!